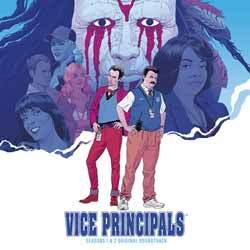 Joseph Stephens music for Vice Principals is going to split listeners down the middle. Those that, like me, grew up in the '80s will see this as a love letter to soundtracks of that era. Those who favour orchestral scores might not appreciate this album's finer points quite as well. Describing the origins of the soundtrack, composer Stephens, said: "This score is both a homage to the soundtrack of my youth as well as an exploration into the inner depths of the everyman." 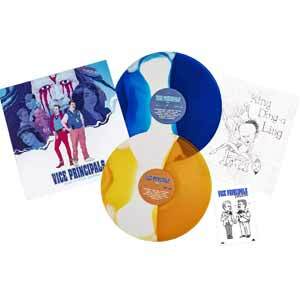 The release is presented on 180 gram North Jackson Warriors Blue and White coloured vinyl (Season 1) and 180 Gram North Jackson Tigers Orange and White coloured vinyl (Season 2). It also features liner notes by creator and star Danny McBride and the composer, a King Ding-A-Ling insert, a printed insert of the album cover art, and a temporary tattoo of Dr. Belinda Brown’s tattoo featuring Gamby and Russell holding hands and eating sh*t.
It contains 64 tracks (1 hr, 23 min, 59 sec) and the joy for me was hearing segments that reminded me of my teenage years. The most obvious example was 'Dark Supper' which sounds like it's walked out of a John Hughes picture. While 'Belinda Finds Dascious' and 'Drum Chase' brought to mind Harold Faltermeyer's score for Beverly Hills Cop. And then there are also timeless tracks, like 'Tub' which is a mellow piano piece. It's diverse, attention grabbing and generally a lot of fun.